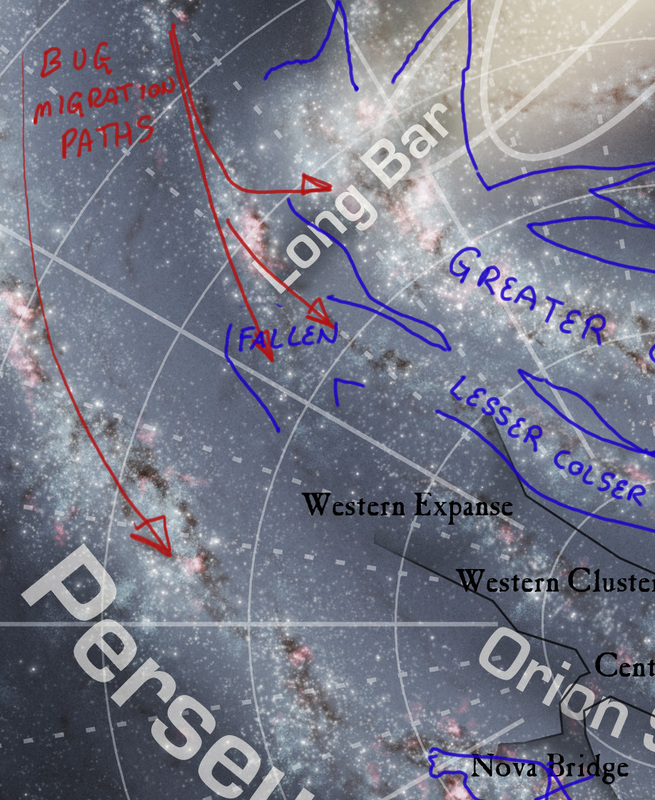 The Colserans have the greatest territorial reach of all the factions. While not radically bigger in size than the Humans, their territory is much denser in stars and mineral-rich worlds. It's what makes their wasteful lifestyle possible. Communication from one end to the other of their territory isn't easy, but because they lack any kind of central government, it doesn't have to be. Their nature is well suited to sprawl. Notice though, the shape of their territory at the edges. Their robo-builders (whatever we end up calling them) prioritize the stars further from the central line of the spiral arms for resource collection. So that the Cols can have the central line to themselves. That allows the 'enlightened' to zip about and communicate more quickly. The fact that the resource gatherers are having to go further out than the general line of advance is telling. It means that the Col are getting starved for resources! They can't expand into the Human Empire, however, because the Western Expanse provides a natural barrier. The stars there are close enough for some trade and minor campaigns, but neither side can amass enough force to break through it and survive the counter-attack on the other side. Hence the stalemate. Grün means "Green" in German, so this is my current name for the Reaver-like mutated humans that live in the Far Stars. They're barbarians, pure and simple. 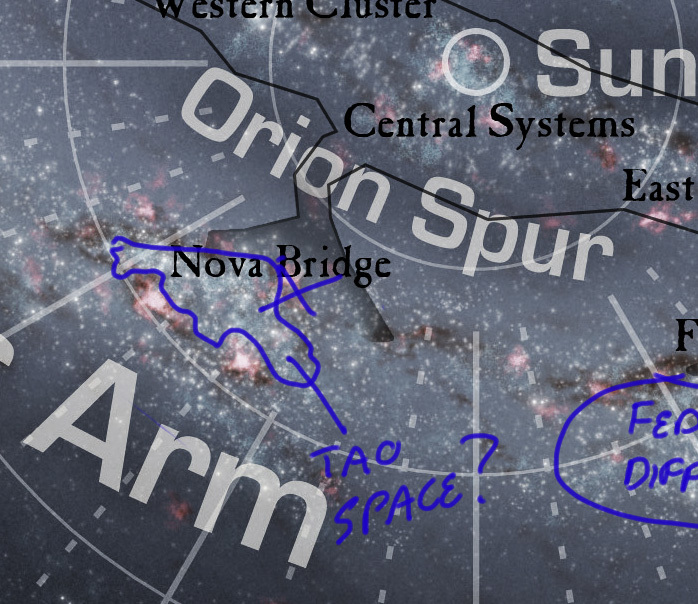 Something hiding in or behind the nova at the end of the Far Stars is (maybe) to blame for the virus/spores/whatever that causes men to devote themselves to mindless aggression. Possibility #2 is that the Human Empire found a nice high-protein fungas on a planet in the Far Stars and then seeded it willy-nilly to provide high-output agro-planets to feed the core worlds. Except that the pollen/spores of the Fungus proved mutagenic. Especially when concentrated in the new factory farms. Tinkering with the genome to improve output didn't help matters either. When breathed in sufficient quantities the fungus takes root in the parts of the brain that curb aggression. The effect is that an infected population starts harboring grudges against all 'others' and begins building weapons. As their thinking faculties start to fail, they reach a critical mass of RAWR and strike out towards the nearest target like a mob of hyper-focused Meth-heads. Eventually they lose all coherent thought and kill each other in orgies of violence amongst themselves. If you capture a Grün and keep it alive (and drugged to calm it), it eventually will die as the essential parts of it's brain are eaten away. 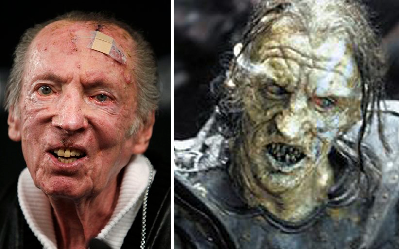 Not pretty. Burn the bodies, as you don't want the fungus to take root. Exact nature TBD, based on other discussions. But I imagine them migrating down the galactic arms from the north-west. 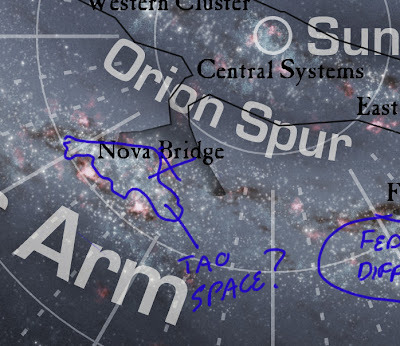 They started on the Perseus arm, and at some point they crossed arms at a bridge and got over into the Long Bar region as well. With the Colserans representing unbridled restraint, and the Humans representing unified oppression, I think that there might be room for a faction that attempts to balance the two. Following Taoist philosophy, more or less. Taoism (pronounced and also spelled Daoism; Chinese: 道教 or 道家; pinyin: dàojiào or dàojiā) refers to a philosophy or religious tradition that emphasizes living in harmony with the Tao (Chinese: 道; pinyin: dào), the source and essence of everything that exists. The term Tao (or Dao, depending on the romanization system used) originally means "way", "path" or "principle", and can be found in many Chinese philosophies and religions. In Taoism, however, it denotes an obscure metaphysical force which is ultimately ineffable: "The Tao that can be named is not the absolute Tao." This is my least developed idea. 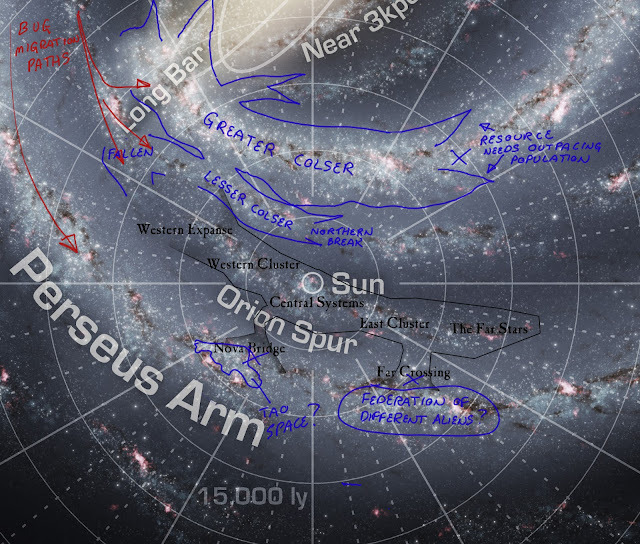 Humanity's only real place to expand is through the Far Crossing into the Spinward side of the Perseus Arm. But they've encountered a problem. The series of small empires that they were defeating in detail have now formed a Federation to oppose them. We're still making gains here, but it's a lot harder now. 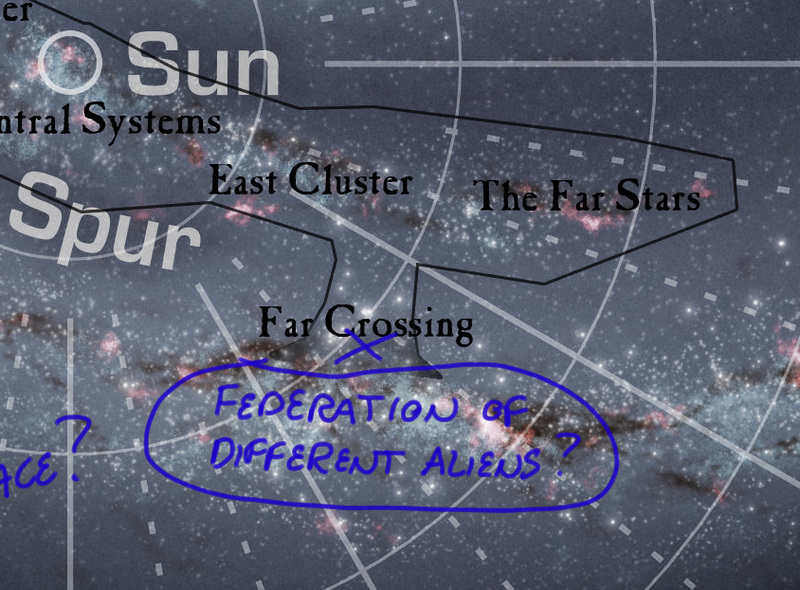 Really, this is just a place that we can put the odd races (like space rats) that don't fit anywhere else. Oblivion_Necroninja has shown the best understanding of the post-scarcity concepts I've outlined earlier. Coupled with a real passion for contributing ideas. So I think he's the natural pick for Fluff Marshal. I'll still contribute ideas in the discussions, but he's now the go-to guy for fluff issues. Watchwood has shown the most interest in being Codex Marshal, so the job's his. It's a bit far off to be expecting finished books, but we need someone to keep track of the faction-specific gameplay ideas we generate. This is going to require some changes to how things are organized. So I'll do my next post on that.